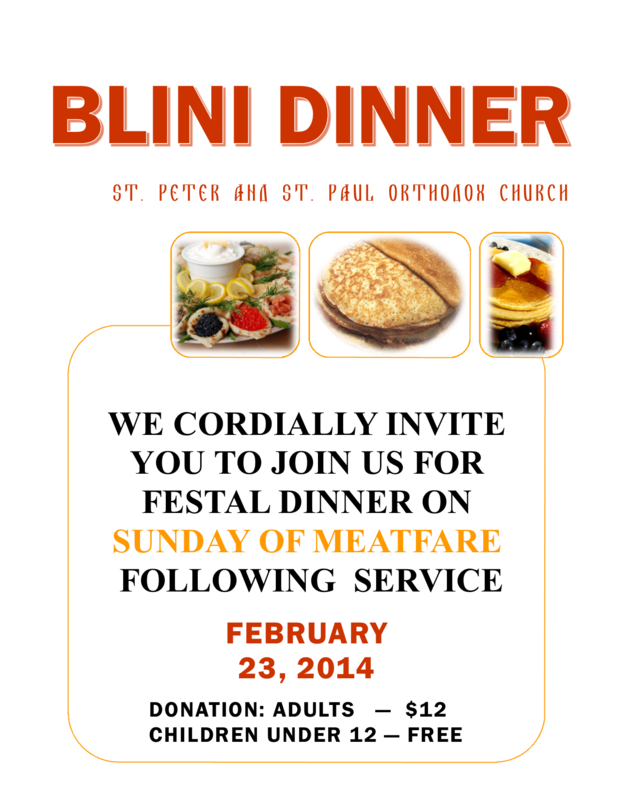 All are welcome to join us February 23, 2014 for our Blini (Crepe) Dinner following the regular Divine Liturgy on Meatfare Sunday. We will be serving blini (crepes) with many delicious fillings and toppings. This celebration is the last day before Cheesefare Week (“Maslenitsa” in Russian), when we prepare for Great Lent by removing meat from our diet. For our church community, and for the rest of the Orthodox Church, it will be the last day until Pascha (Easter) that meat will be eaten. And aside from that it is another opportunity for our church to grow together, and to welcome anyone who would like to join us in this festive day. We hope that you and your family or friends will come to be part of this occasion. Divine Liturgy is at 9:30am. Blini Dinner will follow not long after (around noon). Children Under 12 Eat for free! 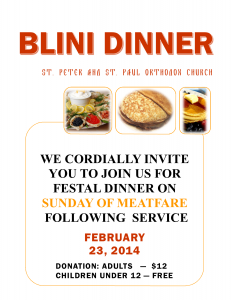 Share the post "Meatfare Sunday Blini Dinner will be February 23"